Especially odours and chemical substances after fire damage, etc. can be a very big challenge to remove and neutralize. Every year the insurrance industry trashes clothes and fabrics for very large amounts because of odours. In addition, the number of people with fragrance allergies and chemical sensitivity increases, which is also a challenge for the damage restoration industry. As the usual detergents containing fragrances are no longer accepted for laundry by insurance customers, there are not many options for eliminating these odours. OdorKlenz Laundry Additive changes that! Thanks to new technology it is now possible to remove odours as well as fragrances and chemical substances by effective absorption and true neutralization. 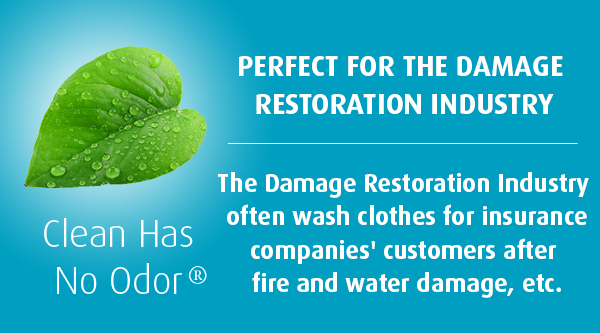 Because of the true neutralization of these many harmful substances, it means that people that suffer from allergies and chemical sensitity now can feel completely safe, having their clothes cleaned by the damage restoration industry. 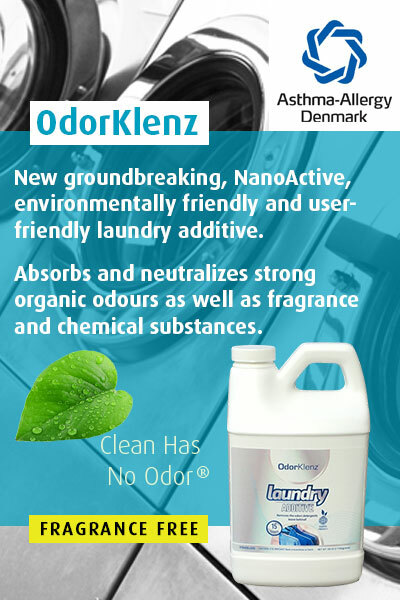 OdorKlenz Laundry Additive is a safe and effective additive that eliminates severe laundry odours that typical detergents can't remove. The technology neutralizes the odours instead of masking with perfumes like many detergents and additives. The product is non-bleaching or staining, and most importantly, no masking agents or additional fragrances are added so your laundry will come out clean and fragrance-free. Removing mildew odours from clothes was once a difficult task, but now you can safely remove musty odours from clothes and linens without the use of harsh chemicals or masking agents. Clothes that were left in the washer overnight you can now save by washing them in a load of OdorKlenz Laundry Additive. OdorKlenz Laundry Additive is available in Liquid form. and all other washable fabrics. Asthma-Allergy Denmark has awarded Odorklenz with "The Blue Label". Products with "The Blue Label" have undergone a risk assessment and is your safety for minimal risk of allergy. The development of OdorKlenz was inspired by people suffering from fragrance and chemical sensitivity, in English "Multiple Chemical Sensitivity", also abbreviated MCS. People suffering from MCS are particularly sensitive to chemical pollution in the air and clothing, and exhibit symptoms because they are exposed to certain chemicals. For use with odor-contaminated clothing / textiles, etc. 56-1525-1 ECOZ Linen - 1 litre, minimum 12 x 1 litre. 56-1525-5 ECOZ Linen - 5 litre, minimum 4 x 5 litre. 56-1525-25 ECOZ Linen - Pail of 25 litre. 56-1525-208 ECOZ Linen - Drum of 208 litre. For use in all sorts of textile cleaning machines/washing machines and carpet cleaning machines. This crisp scent broadcasts a fresh, natural fragrance that is reminiscent of just-washed linens hung in the sun and gently dried by a pleasant summer breeze. For odour neutralization for e.g. textiles. 56-1522-1 ECOZ Potpourri - 1 litre, minimum 12 x 1 litre. 56-1522-5 ECOZ Potpourri - 5 litre, minimum 4 x 5 litre. 56-1522-25 ECOZ Potpourri - Pail of 25 litre. 56-1522-208 ECOZ Potpourri - Drum of 208 litre.